A new HTC for T-Mobile – the Cleo? A leaked image of T-Mobile’s system reveals a new HTC phone, codenamed the Cleo. Unfortunately, there isn’t any other information about the device, only that we might speculate a little here that judging by its name this one may be more of a ladylike kind of handset. 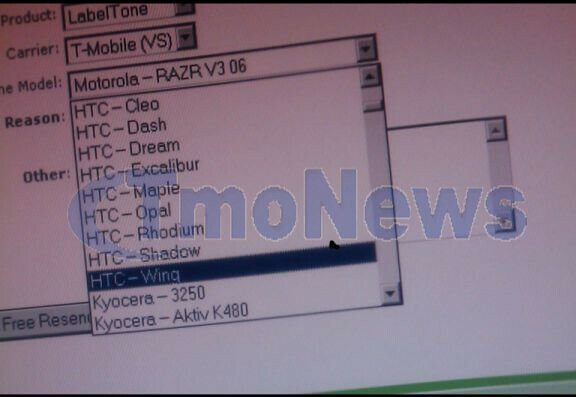 However, the list of phones seen on the image reveals the names of several other HTC devices, which have been out now for quite a while. These include popular ones like the Dash (aka the Excalibur) and the Dream (the G1). In addition, there is the Rhodium, but we expect this one to be the Touch Pro2. So, it is obvious that HTC is pretty keen on using codenames for its phones. The so called Maple is another example of this, since it has been officially announced as the Snap at this year’s CTIA event. What we are hoping for right now is that the Cleo is another new device that’s going to be announced by HTC and T-Mobile soon, but keep in mind that it may be something we have already seen as well.